In the last blog post, I talked about the fabulous 2015 AgExcellence Conference, hosted by Farm Management Canada in Regina. As part of the conference, young farmers contributed to a Twitter feed called “We Wish Parents Understood.” Although I was not able to attend, I did see the Twitter feed and now I’d like to express my take on their comments based on years of coaching young farmers. 3. Let’s get a plan. 4. Parents are entitled to retire. 5. Partners get to choose, they don’t have to be involved. It’s a new year and February has this celebration called Valentines Day. I recall one wife accosting me at a farm show to say thank-you for the best February birthday she had ever had. Apparently her husband was in my audience and heard my encouragement to “date your wife” – show up with cards, flowers, and an invitation for a restaurant meal. He followed through for the first time in their 24 year old marriage and she was shocked, but thrilled to be cherished in that way. I often tell audiences that the next generation is not willing to put in the long work hours that the parents have, and the heads nod in agreement. Unfortunately, I think “balance” is a misnomer, as it is something that is never done, and always needs to be negotiated in the family. It is also tied to the question of farm growth. Is this farm big enough? Can we sustain the pace of work already required? Could we become more efficient with what we already have? How can we get a workaholic father/founder to realize that “we are not him” ever? As with most tough issues, this one requires communication about reasonable expectations. The urgency here is to protect the marriage and family values of each couple. If the farming son values tucking his son into bed with stories, grandpa better stop fuming in the field. 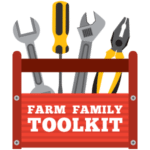 If the marriage crumbles due to lack of attention, you have a bigger threat to handle, and it is called “divorce.” Be intentional about building fun into your farm week. I think this aligns with embracing change, or “that was then, this is now.” Some things, like lack of neigbourly visits and parties, aren’t happening anymore in my neighbourhood. I wish I was present to hear the backstory of this comment. It also speaks to new ways and approaches to farming. I see this with the next generation being quicker to outsource tasks like book-keeping or custom work that pencils out better with the skill sets they want to offer to the farm. It also means embracing new technologies, and using the computer to analyze data for better decision making. Take away my son’s internet for research and he would be crippled. Say this out loud with a gruff, deep voice. Young farmers have high anxiety and stress with not knowing what “the Plan” is for their future options to build equity and create financial security for their growing families. Let’s take the complex and make it simpler. Break your plans down to communication with one another for clarity of expectations, a lifestyle plan that outlines the income stream needed for family living for both generations, a succession plan with timelines as to when the management and ownership pieces will start shifting, and a business plan for the vision of the farm in the next 5 years. The estate plan is for death, so get the wills updated, and have an enduring power of attorney with your spouse, and an alternate. There…was that complicated? No, just a series of plans that are inter-related. Ask me for my $10 binder tabs (elaine@elainefroese.com ), and I’ll get you started. The plan may also involve a discussion of where the parents plan to live for the next 15 years, and who is available to help with child care on and off the farm. Parents Are Entitled to Retire. Parents are entitled to retire, but 30% of farmers in Iowa never do! I prefer the term re-invention, as the parent’s roles change to suit the needs of the new management of the younger generation. 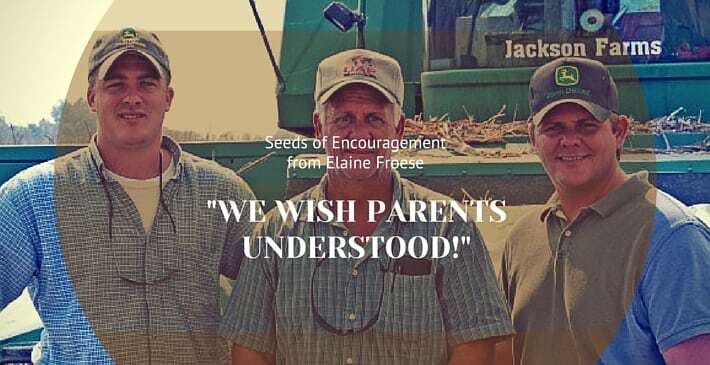 Compassionate farm dads and moms make great mentors, and the young farmers appreciate gracious wise elders who are happy to make collaborative decisions with the energy of youth and the wisdom of experience. If the parents have been wise to create a “personal wealth bubble” outside of the farm’s accounts, they may have funds to play, travel, and gift to non-biz heirs without creating too much stress on the farm’s cash flow. The main point here is to have a full-blown exploration with the parents as to what a good day to them is like for them on the farm in their re-invention years. The message from my 70 something audience in Alberta was “don’t wait until after 65 to travel, do it earlier while you still have your health to enjoy it!” I enjoy the millennials who tell me that their parents deserve to enjoy the fruit of their labour of over 40 years, and they desire that the parents have fun! In 2016 a good percentage of young farmers have two jobs, one on the farm and one away. Some folks who are married to farmers choose not to get involved in the farm business at all. They create a very clear boundary that states, “I married you, not the farm!” Older folks don’t like to hear this. 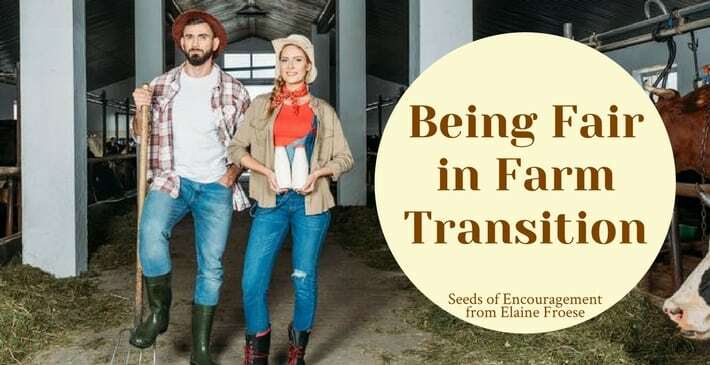 In their perfect world everyone on the farm regardless of gender or roles, pitches in, especially in the busy seasons of spring planting and harvest. My coaching conversations have revealed amazing incomes and energy for other careers that young women especially are not appreciated for. Their off-farm income allows the farm spouse to churn funds back into farm growth, yet their contribution of cash flow for family living is not appreciated or recognized by the founders. Again, the best remedy for this mis-alignment of values is to have courageous, transparent conversations about what roles work for you and which ones you cannot embrace. What would you add to the list that you wish your parents understood?